If you're shooting digital, the largest image sensor you will find at your local camera store is the 53.4mm x 40.1mm medium format sensors inside something like the Phase One IQ3. But if that is just not enough for you... there is one, much larger option. Meet the $106,000 LargeSense LS911: a large format digital camera and purportedly the "world's first 8x10 digital single shot camera for sale." The LS911 is the passion project of Bill Charbonnet, who left his desk job in 2014 to start LargeSense LLC and built these large-format digital cameras. Four years later, the LS911 is his first shipping product. 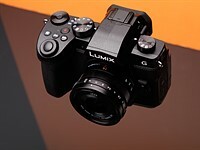 According to the press materials, LS911 features a 12-megapixel 9x11-inch monochrome CMOS sensor (that translates into massive 75 micron pixels), ISO that can be set at either 2100 or 6400, 900GB of internal storage, and the ability to output files to DNG, 16-bit TIFF, 32-bit TIFF, RAW and JPEG formats. There is no CFA, but the monochrome sensor can be used to produce color images (of non-moving subjects) using an in-built 3-shot system and color filters. Oh, and the thing can also apparently shoot 4K, 3840 × 2160 video at 26fps using its electronic shutter. Note: the LargeSense LS45 is a 4x5-inch digital back Charbonnet is working on, but has yet to release. If the LS911 seems a bit bonkers, honestly, that's because it is. We've been discussing it in the office for the past couple of days, trying to figure out how to put this camera in context for our readers, and here's our take: it's cool, but having a sensor this large may not be as advantageous as you think. One of the main benefits of going to a larger sensor is that you can get more resolution as the larger pixels place less of a burden on the resolving power of the lens, but this camera does not take advantage of that. What it does offer is the tilting, shifting and swinging ability large format cameras are known for, and if you can give the sensor enough light, the entire image has the potential for greater 'tonality' because the lower relative shot noise will yield very high signal-to-noise ratio for most tones. That makes the image more amenable to extreme sharpening without accentuating noise. That said, beyond a certain signal-to-noise ratio, tones are already clean enough - particularly with modern full-frame or medium format cameras - that it likely doesn't matter. So, are you guaranteed a noticeable improvement in overall quality of the photos just because of the 9x11-inch sensor? Not necessarily. This is probably more about the feel of large format where you can throw most of the image largely out-of-focus by tilting the focus plane, or keep a large amount in focus without stopping down if you align the focus plane with your subject(s). If, after knowing all of this, you're still interested in dropping $106K on the LS991 (hey - it's guaranteed to be a conversation piece at parties if nothing else), head over to the LS911 product page on the LargeSense website or check out the full spec sheet at this link. And do let us know: what would you use it for? Medium format has thus far been the limit as far as sensor size because large sensors are difficult and expensive to produce. With the LS911, photographers now have an option for high quality large format images other than film. Available now. The USA price is US$106,000 Check www.largesense.com for more information. A 4x5 inch digital back, the LS45, is expected at the end of 2018. The color version of the LS911 is expected in 2020. LargeSense was founded in 2014 by Bill Charbonnet to manufacture single shot, large format digital cameras. Inspiration was from Mitchell Feinberg’s 8x10 digital back. The issue for a business in this tiny market is keeping costs low while delivering a specialty product. After 3 years of development, we are proud to be the first to offer such camera, the LS911! Personally I like this, but most people can't tell the difference between cell phone quality chip and medium format quality chip, images. The rules of 1950's format still apply but, too few notice anymore. The "photo drawing true compression" from it's long focal length lenses and short distance must be beautiful. The window of opportunity with this is maybe, 7 years, serving the uber rich. Wish I could be there. Persepective is only dependant on camera position. Sensor size and focal length doesn’t affect perspective. I’m not wrong. Different focal lengths do not render perspective differently. They merely allow you stand in different positions, and THAT is what changes perspective. Movements asides, a normal lens on 8x10 produces the same image as a normal lens on small sensor. @StopTheGAS: "...different focal lengths render very differently" on the same format and taken from the same place. If Tom Holly means to deny that, then he is indeed wrong. @Tom Holly, ,,,,what you say is true. But it's not enough to just say - 'Perspective is only dependent on camera position'. That's a math equation. I do manipulate a photograph perspective with optical focal lengths, and I have to factor in the sensor size, at the same time, for area of coverage. The "camera position" is the composition. I consider camera placement the dictator, not the lens. A large sensor camera allows me to hold a position when rendering an important background and I consider all backgrounds, and foregrounds important. This is how I photograph, you can call me wrong if you like. "Most people don't care about IQ. They look at a photo for half a second and delete it"
I don't think so. I think they look at a photo for half a second and move to the next photo. I never heard that anybody deleted a photo. Changing focal length does not change perspective. Moving does. Tom, you're going to end up going around in circles with people who don't understand the difference between perspective and angle of view. "This is how I photograph, you can call me wrong if you like." You are wrong. Or more likely you are using the term "perspective" incorrectly. "I do manipulate a photograph perspective with optical focal lengths"
You can't manipulate perspective (which includes relationship between the size of objects at different distances) by changing focal length alone. All you are changing is the field of view, if you stay in the same place everything inside that field of view will look the same. You can give a different feel to your images this way, but the perspective has not changed, and you can do the same thing with any camera system, long focal lengths with a wide angle of view produce the same results and short focal lengths with a wide angle of view. RPJG, yes I suspect you’re right. Getting through to people what perspective actually is - how objects in the scene are rendered relatively to each other, and what influences it - only the viewpoint, and nothing else - is an uphill battle of epic, vertical proportions. h2k - of the people I know, including myself, almost all photos are deleted, hardly any are saved. Most are not worth saving except family and friend photos. Not many know how to take a good photo, especially for most cell phone and tablet hotographers. "h2k - of the people I know, including myself, almost all photos are deleted, hardly any are saved. Most are not worth saving except family and friend photos. Not many know how to take a good photo, especially for most cell phone and tablet hotographers." Mshot - i certainly agree that most photos deserve deletion, and i regret that my current cam doesn't have batch deletion, as had a previous model. But i heard several snapshotters with lots of ugly pics tell me, "why delete, storage is cheap and you never know..." Anyway i'm all for deleting too, and i try hard to weed out as much as possible. I think 1 keeper per day - seen over 365 days - would be a nice rate. Yes I know people who never cull. Culling is one of the best ways to improve your photos! Maybe I will see in 10 years 6x9 digital back with graflok mount for my loved Horseman VH 6x9.... til now I am using 6x9 roll films. Ilford fp4 with Adox ADOLUX APH 09 give wonderful results. Yes please. I have an Ebony SW23 waiting for that back. Bite your tongue, Mateus. How dare you say here that you get great results from (Horrors!) film. The real "photographers" here have assured us that film is dead, that they would never go back, that film does not fit their workflow, that it has insufficient dynamic range, etc. Is there a scanning back in 6x9? "BetterLight" ? @KWNJr The scanning backs fit 4x5" cameras - what's available for 6x9cm is CCD/CMOS sensor backs, but then the sensor is substantially smaller than the 56x84mm of the 6x9 format. Yep stunning. No CFA interpolation getting in the way. No noise. IT'S LIKE I'M STARING INTO HER SOUL!! Holy f... It IS impressive. Not like one couldn’t get a similar photo with a smaller sensor, but the soft focus and low contrast, as well as the exquisite detail, is a combination hard to replicate. I remember being stunned by far higher detail in a shot from the D800 around six years ago, because it was an extreme crop. Apparently you and I have differing standards for "impressive" in relation to our expectations of things costing 6 figures. I don’t expect limited-run, experimental gear that costs X-times as much to be X-times better. We’re way past that point, and diminishing returns have set in. But the achievement of a full-wafer sensor is valuable in my view, and I really hope that this project is successful. Only if color - this is monochrome only so far (unless you do an RGB composite). Yep, a little weird, slightly awkward.. Imagine that video but without the girl in it......(shudders). what is the point of that graphic ? Why not use film, if you like it that big? Ilford still makes sheets. And that grain! Not a match for your heartless CMOS. In addition to the likelihood of having a very high SNR coming from those huge 75 micron photosites, some quick arithmetic has me concluding that this 11.9 MP beast (with 3888 x 3072 pixels on a 279.4 x 228.6 mm sensor) can stop down as far as f/152 (which is f/128 + 1/2 stop) without concern for diffraction inhibiting a desired final print resolution of 5 lp/mm (300 dpi) in an un-resampled, uncropped print having dimensions of 13 x 10.25 inches. This would survive scrutiny at viewing distances as close as the print diagonal. Double the viewing distance and you can double the print size for the same apparent DoF and diffraction, while still stopping down as far as f/152. It's pretty obvious this camera isn't about making large prints. It's about making small, noise-free, diffraction-free prints (or videos) at just about any f-Number available on large format lenses. Still, I find it impractical. It's so easy for me to play "imagineer" while seated at my keyboard, but in my opinion, he needs to get his pixel density up from 13.7 pixels/mm to at least 67 pixels/mm (shrinking his photosites from 75 micron to 15.34 microns), to produce a 287 MP, 9x11-inch sensor, then cut the price in half or more (on increased sales volume, hopefully). I think people capable of spending $100k for a camera would rather use it to make 54 x 44-inch prints, rendering 5 lp/mm worth of actual subject detail, than a print of equal resolution that is little more than a contact print in size. What I really don't understand is why this camera has a maximum ISO setting of only 6400. With such huge photosites, it should be able to function spectacularly well at ISO 64,000 or even higher. In addition to stills, Imagine the 4k or even 8k videos this thing could make in extremely low light conditions. Maybe he's such a quality hound he simply refused to offer ISOs higher than 6400. That might be his biggest mistake. So sayeth he who is just thinking out loud, clueless as to what's actually involved in producing such a complex machine. In the end, I think it's really cool. Thanks for your considerations. I think that having many more photosites would skyrocket the sensor's cost and so, the price. I like this as an experiment but, having used for a couple of hours a Phase One IQ3 100Mp Achromatic last week, which is almost half the price, and having seen the actual pictures that these 2 machines deliver, I'd always choose the P1. If I needed movement, I'd buy the Achromatic back and pair it to a Silvestri or Cambo system. I have to assume that many of the specifications on this camera were constrained by the challenge of creating such a huge, exotic sensor at something approaching a reasonable price. In the end I think the compromises are too severe and the price too high to make this a commercial success, but the development of this thing was obviously driven more by passion than pragmatism. It exists because its creator wanted it to exist, not because it makes good business sense to produce a camera like this. The low max ISO is mystifying though, yeah. Still, I'm glad this exists and I hope the publicity gets this guy the investment he needs to make a more practical second version. Too often it feels like camera makers are all making the same camera, with nobody daring to innovate and make something unusual or creative. This beast may not be practical, but at least it's different. I wish the creator well. Large pixels do not automatically give you high SNR. More light does. A quick computation shows that ISO 2100 is equivalent to about ISO 60 on FF which is very good for noise (assuming standard exposure and FWC) especially in B&W but FF can do that easily as well. I'm a little different from your 152. Perhaps because I used 550 nanometer (green) light. Perhaps because of the "1.22". In any case, I agree with your conclusions. Just not quite the numbers. F/8 for a 200 mm lens = ²⁰⁰/₈ = 25 mm opening. mm = 0.005368 mm pixel pitch. Or 2,217,000,000 pixels for the plate. A two gigapixel camera. Not THAT would be something. I'd personally - at that point - license with the Ansel Adams foundation the name and call the camera the "Ansel D1". Because of the breathtaking resolution. Did they say 12 megapixels....WTH??? Enough for a 4K video. I love looking at large format photos, so trudged through the YouTube demo hoping to be wowed (note that I often use Nikon's atrocious wmu remote software on my D750 just to get the pictures on my phone for quick transmittal) Here, I soon grew cold on the kludgy manual and electronic interface for this thing (see how slow the screen refresh was) how could you hope to fine focus with such a slow screen refresh? the massive rig, not unlike a 25 a pounder field gun but without the cannon's smooth ergonomics means that even in the studio this would be a handful. With a slicker interface and some miniaturisation and that sensor it could be a thing but as it stands it's not compelling. Unexpected. Impressive. Maybe 4x5 or even 6x7 cm makes more sense, considering the exponential cost of larger sensors. The world demands a review of this camera just to confirm the many reasons one would probably not want to drop $106k on this thing. Monochrome? Only? At $106k....Speechless I am. Well, they are gorgeous shots. Bright-colored confetti in the blown highlights (fountain, bike suspension), and spectacular fail in the cypresses swaying in the wind... three successive moments in time, I know. Other than that, I like the bike picture. Interesting how the colors remind me of what you might get from a scanned negative (especially in the shadows). The question is, does it have an extra £100,000 worth of image quality over say a Nikon D850? This is actually a thing for cool effects. Take 3 photos of the beach or a waterfall. Extract the red channel from one, the green from the second, and the blue from the third. Assuming the camera didn't move, all the still objects look normal and the moving water is full of rainbow color effects. Yes, and you don't need to spend $100k to do it. Any tripod-mountable camera can do this in post, and as a bonus you get 3 images /without/ the rainbow effect as backup :). But hey, if you have twice the median income of a family in the USA for a camera, you can do it too! It weighs in at 20kg without the rail and lens. Not a hiking companion then, unless you hire a 9 foot Sherpa. Just 8 kg more than my Toyo 810G 8x10 monorail. But you have to add power supply. Yes, and it was mirrorless 100 years ago... an no one cared. Now it seems to be interesting if you a mirror, no mirror, a rangefinder or a smartphone. Mirrorless seems not to be the future but more or less the past. @dgumshu it has Eye MF. Would be good for sports photography. Fast, portable, well designed UE. Double agents could use it for covert photography. Taking a second mortgage on the house to invest in this futuristic tech. Hopefully it works out, fingers crossed! I'm not clear why this is called a single-shot camera. Single-shot implies you can only use it once, which I'm sure is not the case. It looks like a fantastic thing to try. I'd definitely give it a go. I wish him all the best and hope some of the innovation trickles down. "One shot means the whole sensor is read all at once. Scanning backs have to read parts at a time, which are not useful for subjects that move, and they don't work well with strobes." Another use of the term single-shot is in color capture, where you capture all three color channels in a single shot. In that respect, this is not a single shot RGB camera as RGB would require three separate, filtered captured. thank-you. I think it's normally called a global shutter. No it has nothing to do with global shutter. Single shot is just a marketing term to differentiate it from currently available scanning backs. These have a small sensor they physically move arround in the frame. It is just a normal large sensor. It looks like the avant-garde director's (or the photographer's) dream. 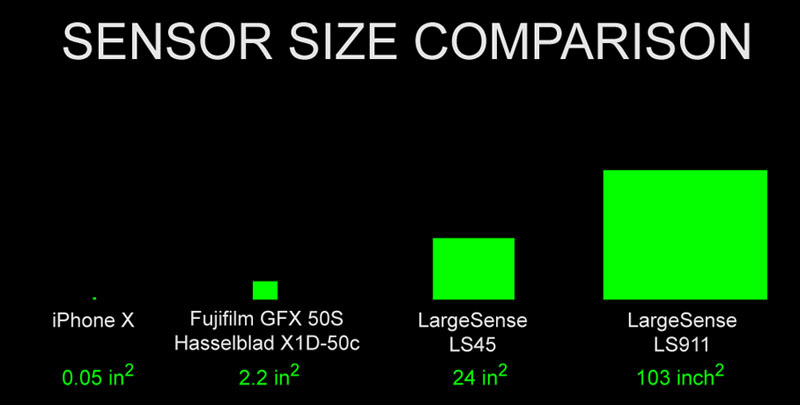 "75 micron pixel size--These are very large and sharp compared to high resolution small format cameras."